USB microphones offer an easy and straightforward way of using them with a computer. Whether you’re recording music, podcasts, or streaming games on Twitch, the Blue Yeti is one of the best USB microphones you can get. The Blue Yeti is one of the best selling USB microphones on the market, and for a good reason. Most USB mics focus on one particular group of users, usually offering limited options when it comes to different parameters and settings. The Yeti, however, features 4 different polar patterns you can choose from, depending on the situation as well as type and number of sound sources you plan on recording. Whether it’s a cardioid, bidirectional, omnidirectional or stereo pattern, you end up with a very clear and natural sounding recording. As it is a USB microphone, there is no need for an audio mixer or even an audio interface. All the important and most commonly used parameters can be controlled via the buttons on the mic itself, including a mute button as well as a gain control knob. So, if you’re looking for a microphone that offers high levels of versatility, but is at the same time very simple to use, look no further than the Blue Yeti! While the Blue Yeti is definitely one of the best microphones in terms of overall user experience, you might consider getting an accessory or two in order to get the best possible results. A shock mount is one of those accessories, which eliminates the vibrations that may come from your desk, the stand or anywhere else. You basically attach the mic to the mount, and then the whole thing to the stand, it’s as easy as that! However, not all shock mounts are compatible with the Yeti, and there's a couple of things you should pay attention to. The good news is, shock mounts are usually very versatile. They are designed to interface with different microphone shapes and styles. Each shock mount I've presented in this article is guaranteed to work with the Blue Yeti mics. You need to avoid shock mounts that are designed for pencil microphones (shown in the picture below). Any suspension microphone designed for condenser microphones will do. Just make sure the shock mount can connect to your mic stand! Most of the shock mounts will come with an adaptor that can used to interface with the different tread sizes of various mic stands. If, however, you find that yours isn't working, a quick search on Amazon should provide you with the adaptor you need. The connection between the mic and the mount needs to be sturdy enough so that the Yeti is securely placed and won’t accidentally fall off. The vibration-absorbing part of the shock mount needs to be able to absorb any kind of vibration that may occur. If it doesn’t you basically just spent money on a useless adapter for your stand. Additional options for setting the right angle of the whole setup is important as well, as correct positioning of the mic is crucial and affects the quality of the recording. 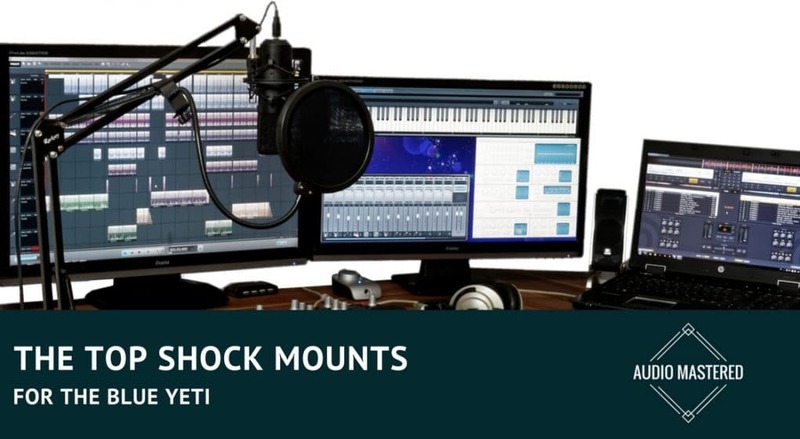 Here’s my pick of the 3 best shock mounts for the Blue Yeti you can find on Amazon! Knox is one of those companies that doesn’t focus on one category of products in particular, but instead offers a wide variety of different items. Their Gear Blue Yeti shock mount is an inexpensive yet pretty effective way of getting rid of those pesky vibrations. The outer ring and the mounting arm are made of aluminum, making the whole thing pretty lightweight but durable enough as well. All of the other pieces are plastic, and honestly don’t feel as solid as I’d expected. Will get the job done for those on a budget. The actual plates that grip the microphone don’t offer much of a grip, but as the mic is secured via the threaded connector, it won’t fall out. What’s really neat is that you can adjust the angle of the mount, so you can easily set the whole thing up in a very comfortable way. The mounting screw offers an extra layer of vibration cancelling, as it is lined with a thick piece of felt. Bottom Line: For just around $20, the Knox Gear Blue Yeti Shock Mount is the best you can get in this price range. Auphonix is a brand that makes affordable shock mounts and pop filters. 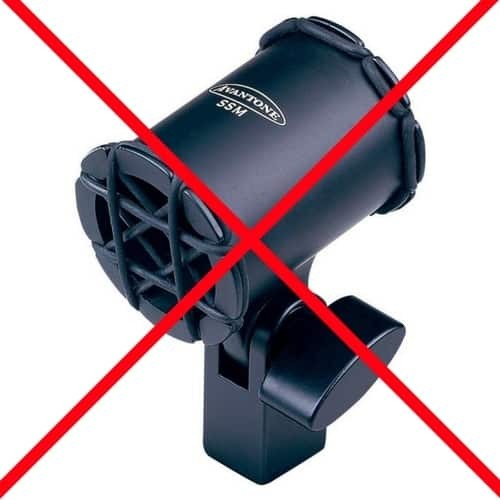 Their aluminum shock mount for the Blue Yeti offers a pretty solid barrier against all kinds of vibrations that may interfere with your recordings. While the design of this shock mount is pretty similar to the previously mentioned model, the main difference is that the part that actually absorbs the vibrations is on the top, and doesn’t touch the mic at all. Instead, the vibrations are eliminated from the mounting screw and don’t affect the performance of the Yeti. The snug fit not only keeps the microphone tightly in place but ensures a noticeable boost in terms of unwanted sounds in the recordings as well. The adapter thread that’s included fits pretty much any stand you might use, with both US and Euro dimensions covered. With aluminum as the material of choice, this shock mount is sturdy, yet pretty lightweight at the same time. Bottom Line: When it comes to shock mounts for around $30, the Auphonix aluminum shock mount is definitely worth spending a bit more. 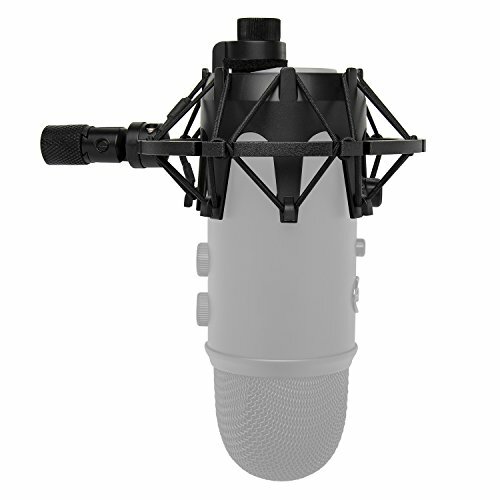 BLUE YETI Compatible SHOCKMOUNT - Designed Specifically For Blue Yeti and Blue Yeti Pro USB Microphones, the Blue Yeti Shock Mount isolates your mic from sound & vibration. No more frustrating post-production editing. 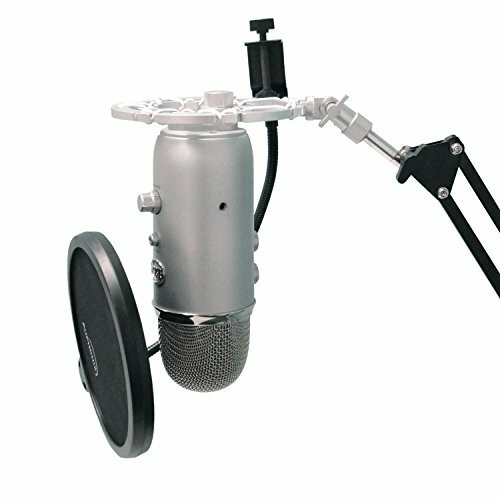 BLUE SNOWBALL Compatible SHOCK MOUNT - Also fits the Blue Snowball Microphone, removing mouse banging and keyboard thumping from recordings. Clean audio is hugely important to keeping your listeners/viewers engaged. Don't give them an excuse to leave. And finally, at number 3, we have the Radius II, coming from Blue. Going for an accessory coming from the same company as the device it’s for may cost a bit extra, but is often your best bet. The mount is composed of 2 separate metal rings that are connected only via elastic strings, eliminating pretty much all the vibrations that may get in the way. The hinge for adjusting the angle of the mount is metal as well, and as it locks, once you’ve found the perfect positioning, you don’t have to worry about it anymore. The best quality on the market right now. The Radius II is compatible with both the Yeti and the Yeti Pro, making it future-proof if you upgrade to the pro version anytime soon. 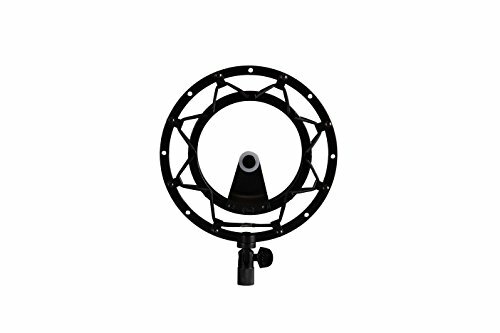 Bottom Line: ​All things considered, if you don’t mind the just under $50 price tag, the Radius II is the best shock mount you could get for your precious Blue Yeti!